Look at it, maybe you have to squint a little. Or do you see a repeating motif of urns, possibly Grecian urns? Or do you see repeating images of grinning sharp-toothed skeleton skulls, just waiting for the opportunity to steal your soul and carry it down to unspeakable torment in the bowels of hell? If you answered yes to the former, you’re firmly in the head-in-the-sand camp, whereas if you answered in the affirmative to the latter, you may just have a handle on things, so just ignore people who might call you hurtful things like delusional and crazy. 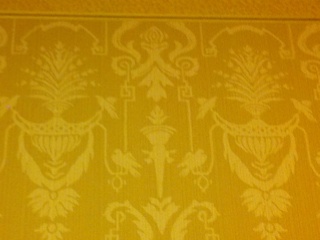 Now, consider this – this wallpaper was in the bathrooms of the guest rooms at the hotel. The room where you can shut away the cares of the world for a few short minutes, or a half hour, depending on whether or not, against your better judgment, you had the burrito for lunch. The room where you should have only expectations of peace and quiet. And that’s where they decided to put this hellish wallpaper?